The first people of the Mesolithic Stone Age arrived sometime after 7,000 BC. By this time the country had a canopy of trees through-out. Willow was the first important producer of pollen along with the juniper and then both of these trees were quickly shaded out by the expansion of of the birch woods. Pollen of pine appears virtually simultaneously as that of hazel. Oak, elm and alder reached Ireland about 9000 years ago, but at first were they were not able to displace the pine and hazel. A visitor to Ireland at this stage would have seen endless sheets of trees interrupted by the water of lakes and river-channels. Ireland did not have wheat, barley, oats or other of the domesticated foods that we eat to-day. Consequently the early people had to have a hunter gatherer type of existence. They concentrated their activities on waterways, foraging on the shores of the sea, lakes and rivers. They rarely ventured into the forested interior, so Ireland’s young ecosystem was almost totally unaffected by these early residents. Besides only the the pathways of wild animals existed at that particular time. We did have wild boars and the Giant Irish Deer is believed to have roamed the lowlands of central and eastern Ireland, weighing up to 800-1000 lbs. and stood at 2 metres at the shoulder, with antler width of up to 4 metres, (weighing up to 35kg) had the largest antlers known to have existed on any deer. There palm like antlers were similar to those of a fallow deer. They had very few enemies due to their size, with the wolf posing very little threat. The earliest concrete evidence of Mesolithic activity in Ireland is to be found in county Antrim (which is Ireland’s only source of flint), county Derry and county Sligo. Mount Sandel (county Derry) was excavated in the 1970s. The archaeologists found the remains of Mesolithic huts and charcoal from cooking fires, and these have been dated to between 7000BC and 6500BC. ‘The Curran’ (near Larne in county Antrim) is a raised beach where archaeologists have found thousands of flint tools. Other would argue that Munster and in particular the south coast would have people earlier than this, since the ice was first to disappear from the Munster area. 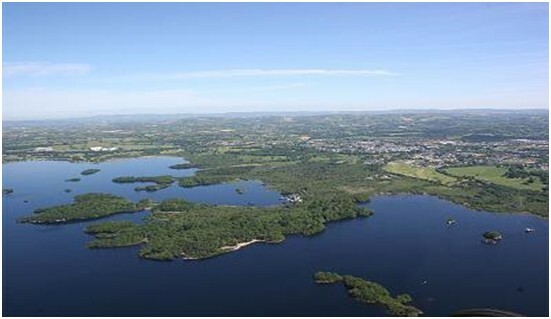 In county Offaly, archaeologists uncovered evidence of a Mesolithic settlement at Lough Boora. The family groups would have lived near rivers and lakes in houses made from animal skins spread over a bowl-shaped timber frame. 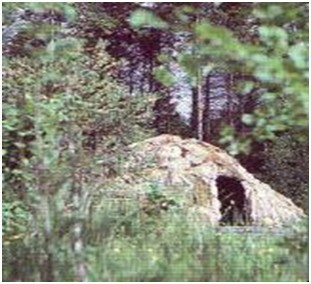 Some superb reconstructed Mesolithic homes can be seen at the Ulster History Park, near Omagh in county Tyrone. These homes were not permanent – the people moved around a lot from site to site and the skins from the houses were brought with them to the new site. Always the camps were set up near the coast, lakes or rivers and they rarely ventured into the forests of the interior of Ireland. There were not enough people in Ireland for there to be competition for land and there is no evidence of weapons being used against other humans. They hunted animals and birds using arrows tipped with sharpened pieces of flint. They also used spears which, although they could not be thrown as far as an arrow, were heavier. Among the animals that these hunters would have sought were deer, duck and wild boar. These food sources would have been most important in the autumn. They also hunted fish. A man would stand motionless in a river with a flint-barbed harpoon, and spear the unsuspecting salmon and eels as they swam past. This required great patience and skill. The hunter pictured at the top of this page (on exhibit at the Ulster History Park) is on a fishing trip. Some may also have fished further off shore, in lakes or the sea, using skin boats stretched over a wooden frame, or dug-out canoes made from tree trunks. Flounder and bass were favourite catches. Fish formed the biggest part of the Mesolithic diet in the summer, while eels were caught more in the Autumn. The meat would have been carried back to their campsite where it would have been cooked over an out-door fire and eaten communally. The skins would have been removed to make clothes and to repair or add to the houses. The women of the community would have also gathered hazelnuts, fruits and berries in the spring, summer and autumn which would have added variety and nutrients to the meat-rich diet. Winter must have been a harsh period, as few food sources were available. It seems that the hunters killed wild boar in the winter. The key elements of a Mesolithic life were thus flint weapons, a meat-rich diet, a nomadic, hunter-gatherer lifestyle and skin huts. The Neolithic people came sometime between 4500 and 4000 BC. Neolithic farming by that time was practiced very successfully in France, Spain and had come into England. They brought with them cows, goats, sheep, pigs, horses, and donkeys. It is conjectured that these animals were transported across the Irish Sea on wooden rafts towed by skin-boats or dugout canoes (hollowed tree trunks). This intervention would fundamentally change the fabric of Mesolithic society. Now the people could provide milk and meat for the family and use could be made of horse and donkeys for carrying things. Additionally, they could build much larger, more permanent dwellings and, perhaps most importantly, this was the first period that people had enough ‘spare time’ in which to innovate. It would be a mistake to think that the Mesolithic people of Ireland suddenly invented farming and became Neolithic. Rather, Ireland’s Mesolithic hunters were displaced or assimilated by Neolithic settlers and brought the technology with them. The Neolithic settlers moved up the rivers from the coastal inlets by clearing trees, freeing out blockages in rivers, so that there simple boats could be used to bring them to the hinterland. Stone axes were used and using wood for Neolithic huts and for heating and cooking. In a research paper by O’Riordan published in 1954 described seven sites at Knockadoon, an island in Lough Gur. All seven sites were mainly Neolithic, but some had continued in use until opening of the Bronze age. All seven sites yielded ox bones in abundance, five yielded some bones of pig (either wild or domestic)and red deer, four yielded sheep (or goat), and two yielded horse. Bear occured on two sites, and it is thus clear that bear must have survived at least until this time in Ireland. Dog (or wolf) occurred on three sites. 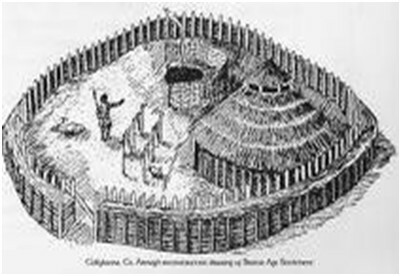 A Drawing of a Neolithic Settlement. They also brought wheat and barley which they planted on the land although it is doubtful if these crops bore much success for a number of years as these crops were not adapted to our climate. 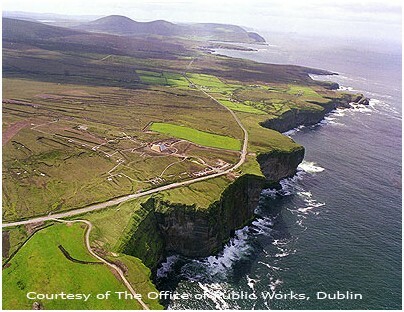 The Céide Fields find in North West Mayo, which are the oldest known field system in the world, over five and a half millennia old has shown that regularised farming system existed. It is a unique Neolithic landscape of world importance, which has changed our perception of our Stone Age ancestors. The remains of stone field walls, houses and megalithic tombs are preserved beneath a blanket of peat over several square miles. They tell a story of the everyday lives of a farming people, their organized society, their highly developed spiritual beliefs, and their struggle against a changing environment beyond their control. The social, economic and visual history of the Irish countryside has been influenced by the climate of the country. The discovery of the Céide Fields originally began in the 1930s when a local schoolteacher Patrick Caulfield, noticed piles of stones which were uncovered as he cut away turf for fuel. In these piles he saw some design which could not have been haphazard. Caulfield noted that the stones had to have been placed by people, because their configuration was clearly unnatural and deliberate. Furthermore, they were positioned below the bog, which meant they were there before the bog developed, implying a very ancient origin. The unraveling of the true significance of this discovery did not begin for another forty years when Patrick’s son, Seamus, having studied Archaeology, began to investigate further. Investigations revealed a complex of fields, houses and megalithic tombs concealed by the growth of blanket bogs over the course of many centuries. It was discovered that these people arrived in a land with a substantial forest canopy. This was cleared to provide access to arable land and to provide building material and firewood. This clearance continued onward and outward away from the area in continuing procurement of firewood. For a while, these people prospered, but some changes led to the development of raised bogs and the transformation of the arable land into barren and unusable land. It is speculated that the removal of the tree canopy helped cause this change. Where tree cover is substantial, most of the rain never reaches the ground and when it did quite a large root net-work was able to absorb most of it for the new growth of leaves. With the removal of a forest, all of the rain reached the ground and, it is believed, leached the earth of its nutrients. The Neolithic Ceide Fileds showing the original field structure. This idea is supported by the presence of an iron-pan in the sub-soil over the area of the Céide Fields. The present recorded rainfall in the North West Mayo area varies from 50 to 80 inches (1250 – 2000 mm) per year and it rains for 250 days per year, tells one the possible reason for its demise. There is little wonder that the corn crops from the Fertile Crescent (with year round sunshine) and controlled irrigation would take many years adapt to the type of climate west of the Shannon river. Besides approximately 50% of the land to the east of a line from the Giants Causeway in Co. Derry (Northern Ireland) to Bantry in South West Co. Cork was suitable for a variation of crops whereas to the west of that line just about 15% was and is suited to grain crops. Most of the remaining land in both parts of our Ireland was suitable to broad leafed trees or for animal production. All this has influenced our crop and animal production until the introduction of the potato in the 16th century. It may have been on that account that some of the newcomers to our island would have concentrated on mining particularly in the marginal crop growing areas. They introduced the use of porcellanite. This is a rock that is tougher than the flint used by the Mesolithic Irish. It can be used more effectively for making axes, digging tools etc. They found that they could chop down much larger trees than they could with flint tools, and this allowed them to more effectively clear Ireland’s upland forests. Porcellanite was mined almost exclusively in county Antrim, in Northern Ireland, and two sites have been excavated by archaeologists: Rathlin Island and Cushendall. Axes from these ‘factories’ have been found mainly in Ulster, but also across Ireland and as far away as southern England. This suggests that, far from being isolated, the Neolithic Irish farmers were trading with Neolithic Britons. The earlier part of the Bronze-age is sometimes referred to as the Copper Age owing to the use of copper in a purer, but less useful state at that time. Later on, the introduction of tin, likely imported from Wales made it possible to forge better and more sophisticated tools and weapons from the new alloy. These tools and weapons would have been available to just a few sections of society and this brought about social changes which saw hierarchies established with the ownership and access to the new metal being the overriding factor in where one ranked in this hierarchy. Bronze Age sword and bucket from the Later Bronze Age was one of the criteria that marked status. The sword handle would have been made of wood or antler and, being organic, is not recovered when the swords come to light during archaeological excavation. The holes in the handle are rivet holes. These rivets would have secured the handle and possibly a small plate to protect the swordsman’s hand. Over 2000 axes have been found from Ireland’s Early Bronze age. The earliest copper mining recorded in Ireland is at Ross Island in Killarney, Co. Kerry. Mount Gabriel in Co. Cork presents the best evidence while at Derrycarhoon in Co. Cork six Bronze Age copper mining shafts and stone hammers were discovered under three meters of turf-bog. Radiocarbon dates for Irish copper mines fall largely within the early and middle bronze age, c. 1800-1300 B.C. Ross Island – Killarney copper-using period was earlier in time, c.2400-2000 BC. Ireland’s richness in Gold in the Bronze Age resulted in many gold items survived and are to be seen in the National museum in Dublin. Ross Island Copper mining 2400 – 2000 B.C. The copper ore was sent by boats to places in Ireland, Cornwall in England and other places. Some of the earliest evidence of mining comes from the Bronze Age (1,300 BC) copper mines at Mount Gabriel in Co. Cork. Around twenty six mines were in use on Mt Gabriel during the Bronze Age, the total amount of ore mined being in the region of 623 tonnes. This natural ore would then have to be smelted, a process which could have reduced the total by almost half, leaving approximately 312 tonnes of pure copper. These figures are all approximations, however they do show how much metal must have been available in prehistoric days. 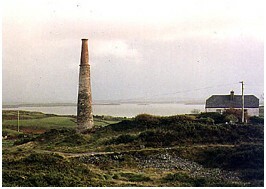 In 1820 Captain Hall opened the Cappagh Mine about 3km from Ballydehob, its 20 metre tall chimney was a landmark in the local area until it was destroyed by a lightning strike in February 2002. There were two operational shafts at the site, and between 1863-73 the mine produced 877 tons of bornite (Cu5FeS4) copper ore prior to its closure in 1874. The term ‘Cappagh Brown’ was also derived from this mine – being a natural pigment consisting chiefly of hydrated oxides of manganese and iron, resembling raw umber and having a hue of reddish brown. Stone Circles, Stone Rows, and Standing Stones are quite evocative in the Irish landscape and still cause people to pause and contemplate their raison d’etre and to imagine the rituals which took place at, or in them and to try to imagine the people who performed such ritual. Were they for marriage?… a baptism of some sort?… funeral rites?… sacrifice? Nothing else in Irish archaeology has this power of connecting the peoples of the past with the people of the present. To stand in the centre of a Bronze Age stone circle on the side of a windswept hill can be a moving experience. Earlier historian’s usually associated the above with the Celts. However, it is thought the Celts came to Ireland in waves of immigration between 800 BC and 100 BC some 2000 years later. The Gaels were the last group of Celts who colonized Ireland. I will expand on this subject in my next CountrylifeHistory chapter. Nice article. It pulls together many things at high enough a level to not fall afoul of a person with an average interest, but points to enough information to allow a researcher to ask better questions (without needlessly falling into that academic habit of endless citation or minutia). Well done, sir.